will be granting scholarships to qualified Armenian American students attending accredited 4-year undergraduate university programs for the 2018-2019 academic year. The application and reference forms must be submitted electronically and are available on the Diocesan website. In the unlikely event that we must cancel either Church or Sunday School due to weather, it will be announced by MetroBlast and on TV. O Savior, grant us mercy and forgiveness of our sins. When the latter years drew near just as the seers had announced, You, our Saviour, arrived in the fullness of time and appeared among men having put on the form of a servant; O Savior, grant us mercy and forgiveness of our sins. On the sixth day You created Adam in the lordly image; but he did not keep the commandment and was divested of the robe; wherefore You, O new Adam, visited the lost one during the sixth age; O Savior, grant us mercy and forgiveness of our sins. Glory to the Father and the Son and the Holy Spirit, now and always and unto the ages of ages , Amen. O temple of light without shadow and bride-chamber of ineffable Word, who removed the grievous curse on Eve, our first mother; implore your only-begotten Son, the mediator of reconciliation with the Father, that He may please to take away from us all disorder and give peace to our souls. misguided ambition, and idle talk. and love to your servant. For You are blessed unto the aged of ages, Amen. (A prayer of St. Ephraim the Syrian, a church Father. Scripture Readings for Sunday, March 18th. We are called to live our Christian lives in spirit and in truth, not just in form or by going through the motions. During this week analyze the way you live your Christian life and see where it falls: in form or in spirit and in truth. Yughakin Offering is a special offering made twice a year at Christmas & Easter to help defray the operational costs of our Parish. “Yughakin” was the price for the oil used to light the lamps of the Church. Though we no longer need oil we still have many operational costs and this offering made during these two feasts is another way for us to show our commitment to this most worthy cause. During this Season of giving, let us remember our Church with a special gift. We need your continued support. Envelopes are available as you leave Church. Bible Study will meet this Tuesday, March 20th from 10:30-11:30AM. 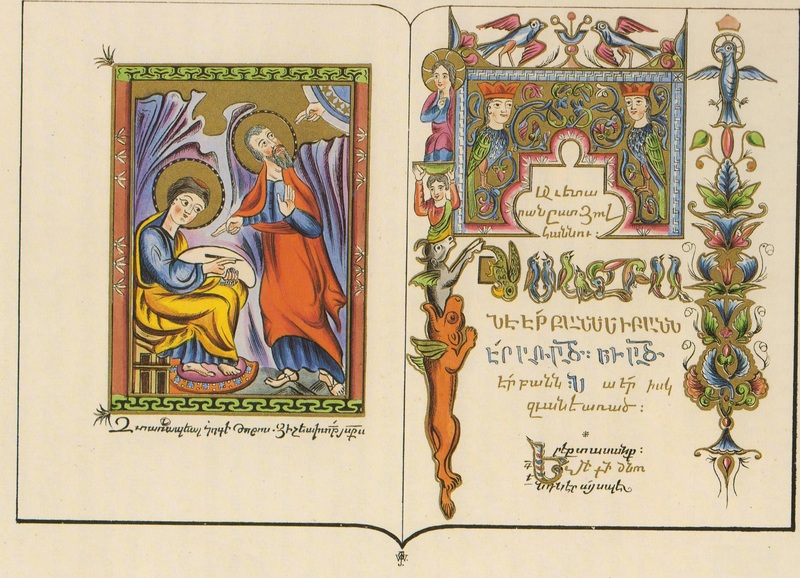 Readings for this Sunday’s Badarak: Colossians 2:8-3:17 and Matthew 22:24-23:39. Readings for next Sunday’s Badarak: Philippians 4:4:7 and Matthew 20:29-21:17. Lenten Interactive Prayer Services: We will have our last weekly interactive Lenten Prayer Services (in English) this Wednesday, March 21st, starting at 6:30PM. 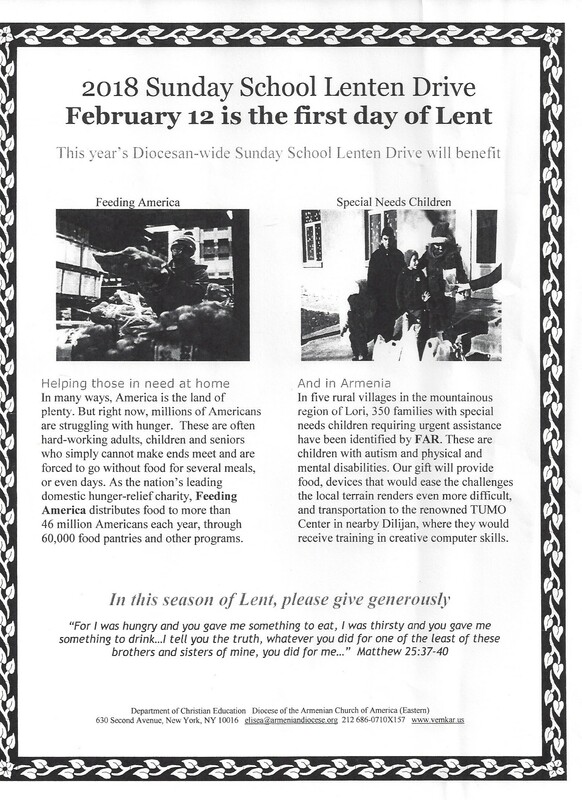 The 2018 Diocesan Lenten Drive: This year our Sunday School Lenten Drive will benefit: Feeding those at home and in Armenia with Special Needs. Palm Sunday Program: On Sunday, March 25th Ronnie Malconian, from the ACYOA Central Council, will visit our Parish and pray with us. The Palm Sunday Fellowship will be hosted by the Miracle Kitchen Food Prep Group. Men’s Fellowship Night will take place Thursday Evening, May 31st, starting at 6:30PM. See Karnig Durgarian or Anthony Barsamian for more information. Fellowship Sign-up: Volunteers are needed to sponsor and work at our Coffee Fellowship Hours after Church as well as make donations toward the expense of the Altar Flowers and Candles. Crucifixion and Burial Service: – 12:00NOON. Syrian Woman Opens Her Own Bakery Thanks to FAR’s Small Business Assistance Program! Lousig, 35, was born and raised in Syria. Six years ago, she left on a 10-day vacation to Armenia with her husband Arman, and their then three-year-old daughter, Alik. They decided to stay forever. “On the third day of the trip, my husband decided that we would not go back,” recalled Lousig. In Syria, Arman, 38, had been a silversmith, and the area where his shop was located had already been hit hard by the war. They decided that it wasn’t reasonable for the family to return. They left all of their property in Aleppo, as it wasn’t possible to transport it to Armenia due to the war. Lousig’s wedding rings, however, which she had left in Syria for the trip, were later sent to her by her family. From that day on, they began their new life in Armenia—searching for jobs, a kindergarten, and a place to live. “Three months later, I found a job as an assistant to an accountant, but it was tough as it was very different from the practices I knew in Syria. When I got pregnant with my son, I stopped working,” said Lousig, a professional accountant who had worked for 12 years at one of the leading interior design companies in Syria. When her son turned one, she was able to busy herself with her second craft—making and selling jewelry. The different organizations then helped Lousig to start. To make sure that taking culinary training was not a waste of time they recommended her to their partners. Soon, the lunch orders started to come in. Then people wanted cakes, which is what she most loves to make. Nine months ago, Lousig registered her family catering company and bakery, which she currently runs out of her home, as Moon Bakery. Just a few days later, she found out that she received a grant and a zero-interest loan from FAR’s Small Business Assistance Program. She used the financial support to purchase a refrigerator, an oven, a mixer, and various containers and cake decorating equipment. The program, which started in 2016, has already supported 17 Syrian-Armenian business owners, three of whom, including Lousig, are women, thus helping to lay a foundation for their economic integration in Armenia. “If I get an order for a hard-to-cook cake, it makes me happy since I’m always up for the challenge,” said Lousig. 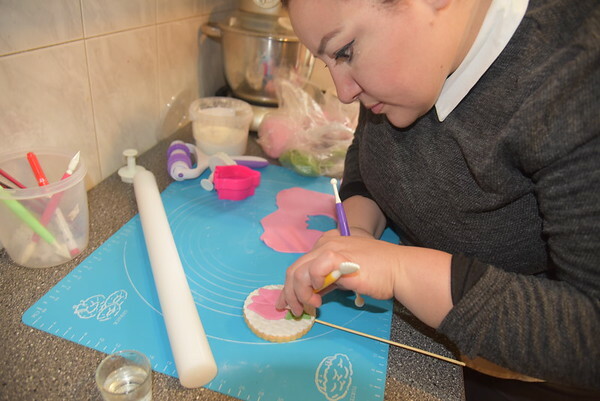 She tries to make her cakes and biscuits as unique as possible as a way to try and develop her niche within the huge variety of similar businesses in Yerevan. She also continues to help her husband, who was the first Syrian-Armenian to start selling silver at Vernisage market in Yerevan. Lousig designs silver jewelry that her husband later has crafted by local jewelers, and which are then exhibited and sold both in Armenia and abroad. On the eve of International Women’s Day, Lousig wishes all women good health and calls them to always create something of their own. We at FAR are so proud to have supported this young, determined business woman. We wish all the best for you and your family, Lousig!